No one likes to feel sick or sore. I know my worst days are when I am laid up in bed with a migraine or pain and I will do just about anything to relieve my symptoms. Now I have another tool to add to my kit- Herbal Hugs. It’s aroma-thermo-therapy for aches, chills, paints, sore muscles, tension, stress, headaches, stomach aches and ear aches. Most of us have suffered from many (if not all) of these ailments at one point in our lives. So what exactly is a “Hug”? It is a soft, polar fleece filled bag with Canadian grains, dried herbs and essential oils. They use a special process to infuse the grains with the scent to ensure that it lasts a long time. Fleece is used because it is soft, durable and easy to keep clean and it has amazing thermal retention. 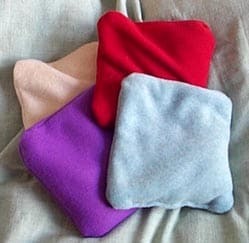 Herbal Hugs sells Neck Hugs, Body Packs, Eye Bags as well as Gift Sets on their website. Hugs come in the following scents: Natural, Lavender, Herbal Mint, Rose Chamomile. They are really easy to use. Â They can be placed in the microwave or freezer depending on your preference or just use them as is. They are also good for children and pets! I received a few products from Herbal Hugs to try out. The first one I tried was the Herbal Hug Neck Wrap in red. It is a 5″ x 28″ in size and is sewn in sections so that the grains inside remain evenly distributed throughout. I have been a long migraine sufferer and my headaches seem to start in my neck. They hurt so bad sometimes that I get very nauseated and need to stay in bed. My neck is super sore and tight. 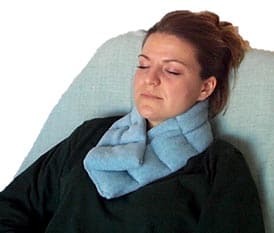 I tried the neck wrap when my neck was sore and also when I had a migraine. I loved how it moulds to the shape of my neck and is incredibly comfortable. I am actually wearing it right now as I type this post. Â Herbal mint is perfect for sore, aching muscles and congestion and works on headaches to. I love the cooling sensation it gives me and how it seems to work itself into my tight muscles to soothe and relax them. Its smells great too! It is the perfect way to relax after a long day. I prefer mine room temparature, but it also feels good when its cold when you have a migraine. Cold seems to help me when I am in pain. It costs $29.99. The Herbal Hug Body Pack in Rose Chamomile smells amazing! Roses are my favourite flower and I love the fragrance. The Body Packs are 7″ x 8″ in size. I use mine on my tummy when I am not feeling the best or have a sore stomach. Its great to use even when you aren’t sick and is comforting to have on your body. John likes to use this heated up in the microwave on his lower back. It costs $19.99. The Herbal Hugs Eye Bag in Herbal Mint is awesome! 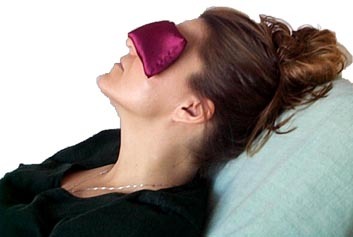 It is a soft flaxseed-filled pillow that works wonders on sore and tired eyes. It is 9″ x 3″ and satin covered so its sooooo soft and luxurious. It is best used at room temperature or as a cold pack. Just make sure to put it in a freezer bag before putting it into your freezer! I love using this bag when I have a headache and it works great to help take some of the pain away. I also received a little vial of Peppermint essential oil which can be used on the eye bag to add an extra kick. Only a drop is needed. Peppermint is good for headaches, nausea, pain and congestion. Remember to NEVER use essential oils directly on your skin! This handy eye bag is only $9.99 and is pure bliss! Its a toss up for my favourite product between the neck wrap and the eye bag. These are two of the tools I use to combat my headaches. Visit Herbal Hugs and see all the products and what ailments they can treat. Their prices are all in Canadian dollars. I love natural healing! I like the Neck Wrap in Herbal! I’d love to have the ‘Herbal Mint’ Herbal Hug Neck Wrap! I’d love to have the ‘Herbal Mint’ Herbal Hug Neck Wrap. Thanks! The lavender body pack would be wonderful to have! I like the Eucalyptus Oil. Follow you on Google Friend Connect. Like Simply Stacie on Facebook.